Samsung Galaxy Note 3: Where can I get it? The Samsung Galaxy Note 3 release date is, well it's actually come and gone, so now's the time to start planning where you'll get hold of one. The newly announced phone-that-moonlights-as-a-tablet is available on a number of British networks, and we've sorted out what's what to make life easier for you. Not sure if you want one yet? Our hands on Samsung Galaxy Note 3 review should help you decide. The 4G-loving EE has the Galaxy Note 3 available in its 32GB guise, although there's no option of a free handset. You can pay as little as £29.99 up front, but you'll need to commit to paying EE £51 every month for two years - you do get 20GB of data each month though. The handset will set you back £69.99 on EE's recommended £46/month 24-month contract which comes with 10GB of data and unlimited calls and texts. If you don't want to be locked in for two years then you can always plump for a 12 month contract, but you'll be paying more up front. The lowest initial payment is £49.99 on a £66 per month contract which gives you 8GB of data. Orange is charging £42 a month with an initial outlay of £120 on a boring old 3G contract, although its site says the Note 3 is still in pre-order. Meanwhile over at O2 the stock is in, the 4G is live and there's an option to pay nothing up front for a Samsung Galaxy Note 3. That £0 up front does come at a cost - £42 per month to be exact if you want a two year Refresh 3G contract with 1GB of data, or £47 per month for the same period with 4G connectivity and 1GB of data. There's no sign of PAYG or SIM-free offers here though. Update: The Samsung Galaxy Note 3 is available on Three too, with contracts starting at £34 a month for the unlimited data, 500 minutes and 5,000 texts. Plump for the £38 per month option and you'll get all-you-can-eat-data, 2,000 minutes, 5,000 Three to Three minutes and 5,000 texts. All these plans are based on a 24 month contract with an upfront cost of £99. There's no sign of any PAYG tariffs just yet though. Even though the Three website says the Note 3 is in stock, the delivery estimate says October 10 - so you may have to wait a couple of weeks for your phone to arrive. Vodafone hasn't shown any sign that it will be stocking the Samsung Galaxy Note 3, but we're chasing the big red for more information. 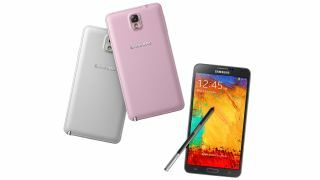 The keen-bean phone retailer is selling the Galaxy Note 3 on a variety of tariffs spanning four networks - although two of those (T-Mobile and Orange) and owned by EE. The other network in question is Vodafone - who has been oddly quiet on everything Note 3 thus far. You can grab yourself a free Note 3 on Orange or Vodafone from Phones 4 U, although it will require you signing up to the network for two years and splashing £47 per month. Carphone is also getting in on the Galaxy Note 3 action with tariffs from all the major networks listed above, plus TalkMobile, so there's certainly a lot of choice here. If you pick yourself up a Galaxy Note 3 at Carphone Warehouse you can also get £100 off the Galaxy Gear smartwatch - which currently only works with this handset. Fancy some SIM-free, Samsung Galaxy Note 3 action? We'll we hope your pockets are deep as it's not coming cheap. Expansys has the white Note 3 in stock now, with the black version expected in the next few days, and both will set you back a hefty £619.99. The price is the other side of £600 over on Clove, which claims it has both the black and white Note 3 models in stock at £594 a pop. Unlocked-Mobiles expects stock to arrive on September 26 and is offering both colours at 598.97 a piece.